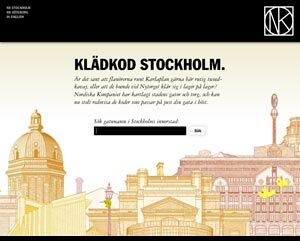 New campaign site for department store NK: Dresscode Stockholm. Type your street address to find out what to wear this autumn to fit in, depending on where you live. A little bit of a downer that they didn't take effort in doing a male fashion version as well. Only female fashion in the results.